Many people will join their extended families over Thanksgiving weekend and many will find bratty nieces, nephews, and cousins getting underfoot. 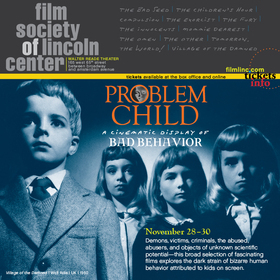 The Film Society of Lincoln Center in New York has a solution -- an eleven-film series at the Walter Reade Theater entitled "Problem Child: A Cinematic Display of Bad Behavior" that conclusively shows that persistent annoyance is the least of anybody's worries. The series starts on Friday, November 28th, "Black Friday," and concludes on Sunday, November 30th. Over the three day period, a wide range of movies will be shown, from dramas (The Children's Hour and Compulsion) to horror flicks (The Bad Seed and The Omen). Mommie Dearest (Frank Perry, 1981) - 11/28 @ 12:30 PM and 11/29 @ 9:30 PM. The Omen (Richard Donner, 1976) - 11/28 @ 3:00 PM and 11/30 @ 8:30 PM. The Innocents (Jack Clayton, 1961) - 11/28 @ 5:10 PM and 11/30 @ 1:30 PM. The Children's Hour (William Wyler, 1960) - 11/28 @ 7:10 PM. The Exorcist (William Friedkin, 1973) - Original Theatrical Version - 11/28 @ 9:20 PM. The Bad Seed (Mervyn LeRoy, 1956) - 11/29 @ 1:30 PM. Tomorrow, The World! (Leslie Fenton, 1944) - 11/29 @ 4:00 PM. Compulsion (Richard Fleischer, 1959) - 11/29 @ 5:45 PM. 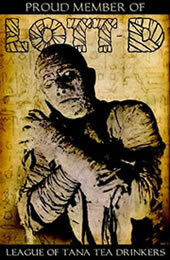 Village of the Damned (Wolf Rilla, 1960) - 11/29 @ 7:50 PM. The Fury (Brian DePalma, 1978) - Introduction and Q&A with star Amy Irving - 11/30 @ 3:30 PM. The Other (Robert Mulligan, 1972) - New 35mm print - 11/30 @ 6:15PM. You can purchase tickets for individual screenings or a series pass (which will get one person into five screenings) at the Film Society website.